This Game Is For The Birds! 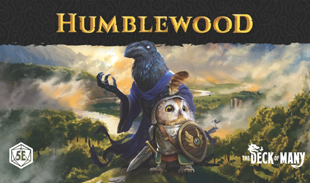 Sorry, sorry… Humblewood is a new campaign setting for the Dungeons & Dragons 5E role-playing system, created by Hit Point Press. It made headlines because they recently completed a very successful Kickstarter campaign — to the tune of more than a million dollars. And why do we care about it here? Probably because it includes several new anthropomorphic bird bird and mammal species that can be used as player characters. The Kickstarter page is still up, so check out the preview and see what we mean! Also at Further Confusion we learned about Shard, a fantasy role-playing game with a considerably anthropomorphic bent. The creators, Shard Studios out of Austin, Texas, we running several games to introduce new players to the system. 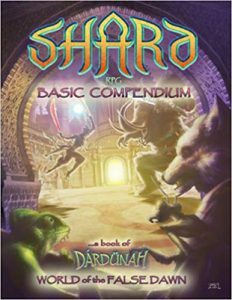 Here’s what they have to say on their home page for the game: “Shard Studios invites you to enter the fantastic world of Dardunah, the vast shard of a shattered realm, as presented in the colorful pages of the Shard RPG! Many years in the making, this system allows players to choose from a wide variety of animal people who are the main cast of the many adventures this otherworldly setting offers. Skyships glide through shimmering clouds past majestic crystal peaks. Giant insects prowl alien jungles or lurk in the sparkling emerald seas. Warriors with blades of diamond and amber duel across crimson sands. And mystics chant in shadowy chambers as their spirits wander abroad.” There are several books of game play and background available now. Here’s an interesting artist we found at CTN Expo. Natalie Murrow is an animation artist and illustrator (with lots of animal designs!). One of her big projects is an app for young folks called Kidomi. She says: “Kidomi is an app I worked on at Fingerprint Play. It is a mobile app that houses hundreds of 3rd party licensed activities from brands you know and trust. 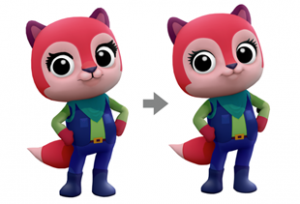 All of the activities are streaming, so you can access them without having to download, and are all available through a single subscription.” In addition to doing the interface design and several icon animations, she also designed a series of funny animal avatars that kids can customize and make their own. 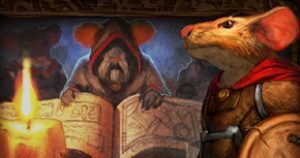 So here’s what we just found over at Slash Film: “Variety reports that [Dreamworks Animation] is in final negotiations for the movie rights to Jerry Hawthorne’s board game Mice and Mystics. The role-playing game, which was our No. 1 pick for games that should be adapted to film, follows mice heroes who must race through a vast castle to break the curse of the evil Vanestra, fighting rats, cockroaches, spiders, and the castle cat, Brodie. Its complex, deeply involved story seemed perfect for a big-screen adaptation, and it seems that DreamWorks thinks so too. If talks go through, The Hills Have Eyes and Horns director Alexandre Aja is set to direct a script by Aquaman scribe David Leslie Johnson. Vertigo Entertainment’s Roy Lee and Jon Berg are producing.” Sounds like there is some serious talent behind this project, yes? Don’t Let The General Get You! Lo and behold, it looks as if one of the original anthropomorphic role-playing games is digging into making a come-back. 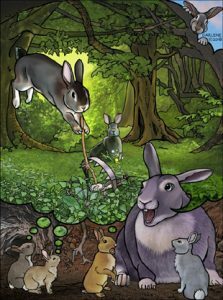 Frog God Games have opened a new Kickstarter campaign to try and bring about the 3rd Edition of the venerable game Bunnies & Burrows. We’ll let them tell you about it: “It’s not easy being a rabbit. Dangers abound in a hostile world of forests, fields, and farms. You and your woodland companions — rabbits and friends of rabbits — are a tough band of protectors and explorers, ready to take on the challenge. This tactical role-playing game views the world from a unique angle, with different goals and approaches than any kind of traditional role-playing game. Rich and complex mechanisms allow you to cover any angle of rabbit life — including war-gaming — if you choose to expand the game beyond the basics of role-playing woodland animals in a world where nature is red in tooth and claw. Frog God Games has partnered with Dr. B. Dennis Sustare and Dr. Scott R. Robinson to return a venerable and influential piece of tabletop role-playing games to print. This tactical role-playing game weighs in at approximately 200 pages of full color adventure in the style of Redwall and Watership Down.” With just under a month to go (as of this writing), they’ve nearly reached their funding goal. So we were talking about new games. 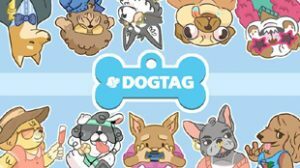 Also at Long Beach Comic Con we came across the creators of Dogtag, “the attention-grabbing card game for dog-people”. Here’s how they describe it on their web site: “The inspiration for Dogtag came from Los Angeles, where finding people who have tens of thousands of followers on Instagram is a casual occurrence. Anywhere you go you’ll see people posing in front of walls, taking pictures of food, and sneaking selfies. Showing off the highlights of our lives is a trend we all can relate to, and it only makes sense that we decided to create a card game following these themes. DUH. A splash of pop culture here, and a bucket-load of dog puns there, and this is what we get: A fun satire on social media packaged into a heckin’ cute card game.” Which is available now. The web site has video previews too. 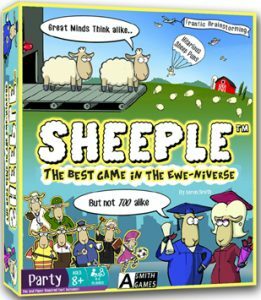 And then, there were those two guys wandering around Long Beach Comic Con in sheep costumes… Turns out they were busy plugging a new card game called Sheeple, which was developed by Aaron Smith. According to the web site, Aaron ” … needed a way to tweak his game, and found inspiration from the book he was reading at the time, Animal Farm, by George Orwell. While Animal Farm is a sad, dystopian book about an animal-led Communist revolution gone wrong, the idea of animals walking on two feet inspired him. ‘Sheeple’ is normally a non-favorable term for people who act like sheep; who are docile, compliant, or easily influenced, and do not think for themselves. However, spun the other way, ‘Sheeple’ could also mean sheep who are trying to become more civilized and people-like, a positive. It would be a great way to theme a game about thinking like others. Some sheep puns could even be thrown in there for good measure.” Having finished a successful Kickstarter campaign, chances are this will all make more sense when the game comes out in mid-September. Baa! “My name is Arnel Baluyot, and I am a Portland-based illustrator specializing in art prints, inspired by pop culture.” A simple enough introduction from his web site, Ninjabot. 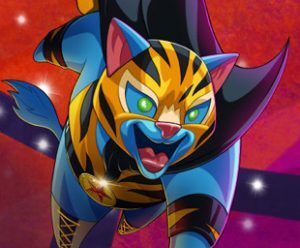 One project in particular is of interest here though: Popcats Fighter, a new card game the artist is developing. (Official slogan: “Unleash The Furry!”) Here’s what he says: “PopCats Fighter is a strategic card fighting game where your inner PopCat can fight against your friend’s inner PopCat in a sweet 1v1 battle(or Tag Team 2v2 mode) by attacking them with some gnarly Move Cards until your opponent’s health goes down to zero! Unless of course they fight back with Action Cards that are designed to make the game fun, and fast! The better you do in the game, the more chances you will have to play some sweet Super Moves that will potentially make you the winner!” Got all that? Visit the web site to see more, and watch the Kickstarter campaign starting up in July. More strangeness we found at WonderCon. Unstable Unicorns is a new fantasy card game, which apparently was one of the most successful Kickstarter campaigns of last year. Now the starter pack (and some bizarre expansions) are available at their web site. 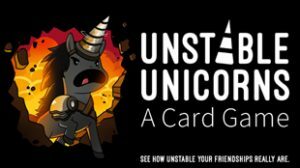 “Unstable Unicorns is a strategic card game about everyone’s two favorite things: Destruction and Unicorns. Designed by the creator of TeeTurtle, Unstable Unicorns features a combination of stellar artwork and carefully calibrated gameplay for an infuriatingly magical experience.” The web site features an introduction video that makes things clearer. Sort of.